Apiumcrispum, Apiumpetroselinum, Carumpetroselinum, Common Parsley, Garden Parsley, Perejil, Persely, Persil, Persil de Naples, Persin, Petersylinge, PetroseliniFructus, Petrosilini Radix, Petroselinum crispum, Petroselinum sativum, Petroselinum vulgare, Persil CultivéPrajmoda, Racine de Persil, Rock Parsley. Parsley is light green, biennial plant that is used as a spice. It originated from Iran. It is very common in Middle Eastern, European and American cuisine. Parsley is used because of its leaves, similar to coriander (also known as Chinese parsley or cilantro), although it has a milder flavour. It is one of the main ingredients in the Mediterranean green sauce, called salsa verde. Dried parsley is an incredible addition to green salads. 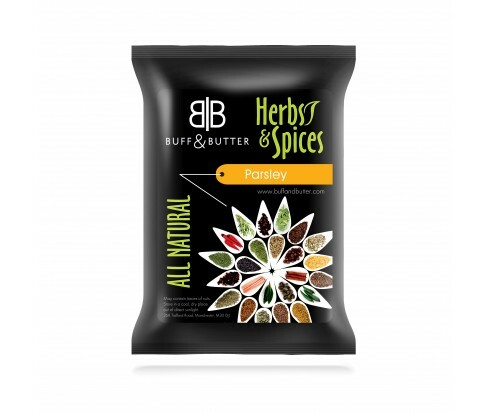 Dried parsley leaves can be used for thepreparation of dips, chutney, and pesto. It is great forsauces, stews, rice dishes,cheese spreads, vegetables, fish dishes andomelettes. Dried parsley might be used as a part of fried eggs, soups, pureed potatoes, vegetable dishes, pasta andsauces for fish, pork, poultry and veal. Parsley, together with mint is the key ingredient in the Middle Eastern salad - tabouleh. It is the base of a maître d’hôtel butter, garlic butter, and numerous other preparation. Protection against rheumatoid joint pain. Parsley leaves are useful for a healthy heart. Parsley can reduce the threat malignancy such asbreast, prostate and alimentary canal cancer. Parsley leaf may support the immune system. Dried parsley has apositive effect on blood vessels. It has anti- bacterial properties that which reduce the development of bad bacteria. Ancient Greeks believed that parsley sprung from the blood of the hero Archimedes after he killed a dragon. Parsley is an annual herb, developing from spring until the freezing weather. In some milder climate areas lives through the winter. The second spring after the planting, the plant blossoms, goes to seed and ends its life cycles. After the planting, the parsley leaves are prepared to be dried and stored.